Hello ladies! !~~ヽ(｀◇´)/, aww finally I can make a post again, yesterday I attended an event by Revlon and today I attend a press launch event again by Revlon, I spent my times for captured products and writing (◎_◎;). I'm going to make a review about this color lens first. This contact lens is sponsored by Tomato Shop, a contact lens store which is based in Indonesia. They were so kind to emailed me and let me choose what kind of lens I wanna try. And I decided to choose Miss Eye because this brand is still new in Indonesia and no many people have try it before. 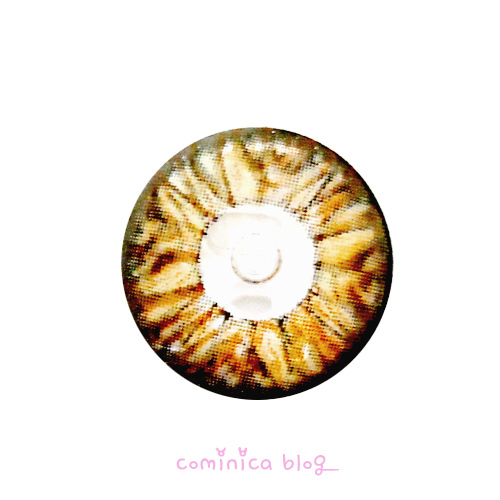 So, this is my EOTD when use this color lens（-＾〇＾-）. What do you think? My eyes is really dark so the color look more tone down, but what I love about this lens is, the color look so natural on my eyes, more natural IRL ❤. It doesn't has a huge enlargement effect like other circle lens. 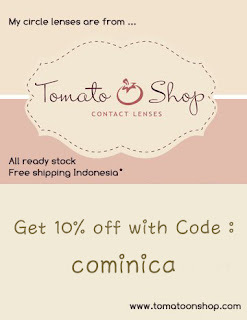 Btw, for ladies who live in Indonesia you can get 10% Discount @Tomato Shop if you use my code : cominica, you can check out their facebook page on here and Miss Eye website on here. Oh the packaging is so pretty indeed!! Wow! The case is so pretty! : D You look really pretty in the lenses! The case is really cute! But, not very useful lol! I thought it was a flip open case at first, then you could use it as a lashes case... too bad!